Louisburgh, Co Mayo is a "planned town" with many of its original eighteenth century features. But more unusual is that it takes its name from a town in the province of Nova Scotia, Canada - when usually the reverse is the case. It is believed to be named after the fortress town of Louisbourg in Nova Scotia where a member of the founding landlord's family, Henry Browne of Westport, took part in the seige of 1758, and afterwards was a member of the the Louisbourg Grenadiers. Henry Browne was an uncle of John Dennis Browne, 3rd Lord Altamont, who married Louisa Catherine Howe, daughter of the Admiral of the British Fleet during the American Revolutionary War, and who also had family involvement in the siege of Louisbourg. Their son married Catherine de Burgh. When the new town was built about 1795/1796 in the western part of His Lordship's estate, the name Louisburgh represented the family connections with Louisbourg and the combined names of the two ladies, Louisa Catherine and Catherine de Burgh. 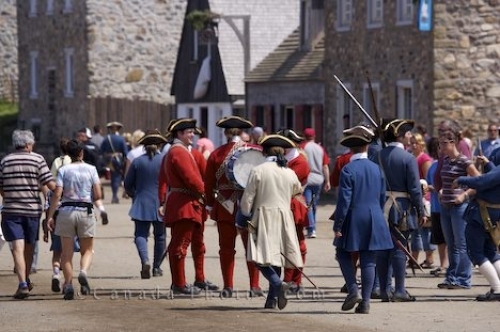 The Fortress of Louisbourg Historic Park c. 1744 is the largest historical reconstruction in North America. It is the reconstruction of an 18th century French fort and town. Located south of Sydney NS on route 22.